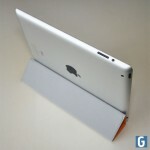 I have been using Apple’s first generation iPad ever since it was launched in the UK last year and its becomes an integral part of my daily life, is the new second generation iPad 2 from Apple worth an upgrade, have a read of our Apple iPad 2 review to see what we thought of Apple’s new tablet. 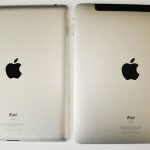 When the iPad 2 was launched, I substituted my first generation iPad and have been using the new Apple iPad 2 for the past month, and yes the new iPad is slimmer, sleeker and faster than the first generation version and also has a few unique features only the iPad 2 can perform, but does the new iPad 2 have the magic to tempt new owners to take the plunge? 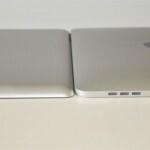 As soon as you first pickup an iPad 2, after using a iPad for some time the lighter and slimmer dimensions of the iPad 2 are easily detected, which is not a surprise as the new iPad 2 is thinner than the iPhone 4 and is roughly two-thirds the thickness of the original iPad, and only 12 percent lighter of the original, 17 percent lighter when comparing 3G models. 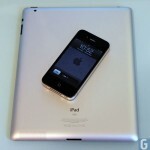 The iPad 2 measures 7.31 by 9.5 by 0.34 inches, and weighs in at 1.33 pounds (Wi-Fi-only version). 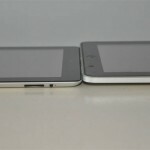 AT&T and Verizon 3G versions are slightly heavier at .01 and .02 pounds. 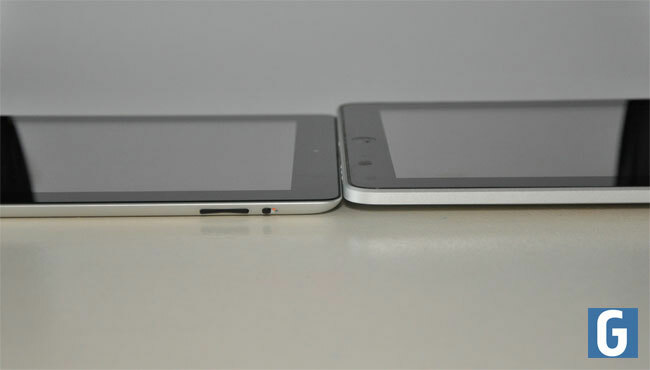 At its thickest point, the tablet is just 0.34-inches and is slightly narrower at 7.3-inches compared to the originals 7.47-inches. 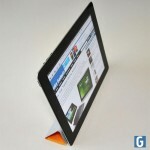 All the saving in weight and size make for an impressively small footprint. 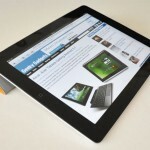 The new iPad 2 is now equipped with a Apple new A5 dual core 1GHz processor and it also features 512MBof RAM, which is twice as much as the original, providing extra power when using, viewing or playing applications which is also supported by the graphics performance on the iPad 2 is as much as nine times faster than on the original iPad, according to Apple. 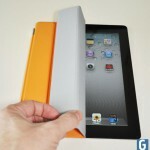 Perfect for the new generations of game in the app stores that are now tweaked to accommodate the dual core processing of the new iPad 2. The display of the new iPad 2 is identical to the previous model, a 1024 x 768, 9.7-inch IPS display and you will still experience the same problems trying to read the screen in direct sunlight as you do on the first generation device. 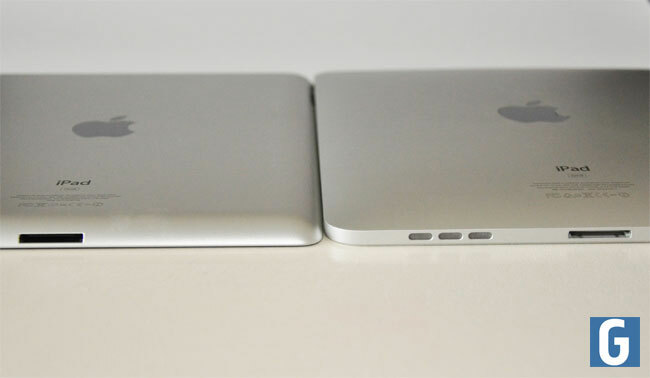 As expected a standard 30-pin dock connector is along the bottom, while the top reveals a power / sleep button on the upper right side, and a 3.5mm headphone jack on the left. 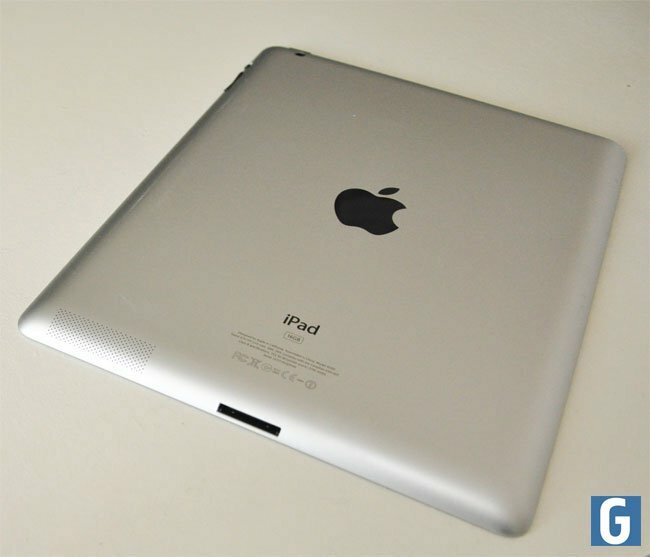 The iPad2 is also fitted with an ambient light sensor, an accelerometer, and a new addition, a three-axis gyroscope, the volume buttons and mute / rotate switch sit on the back left side of the device, while on the right you’ll find the Micro SIM slot (on 3G versions only). 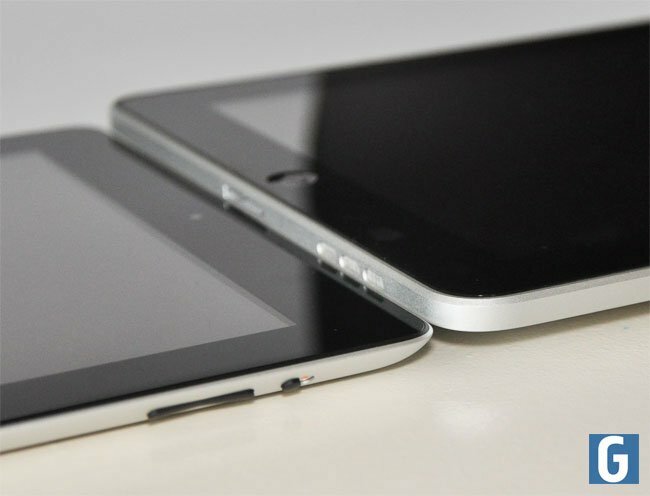 Together with the hardware and software advances in Apple’s iOS 4.3 release the iPad 2 is noticeably quicker than the original, and is currently the fastest iOS device on the market, but remember the speed when using applications is dependant on whether those apps have now been updated and tweaked to take advantage of the new dual core processor. There are a number of different models available depending on your country which tackle both wireless and data connectivity, there are basically two models, just like the original iPad, a WiFi only version and a WiFi and 3G version, in the US there is a Verizon 3G version, or an iPad of the AT&T / GSM variety, all equipped with Bluetooth 2.1+EDR is on board, as is an AGPS chip in the 3G versions. 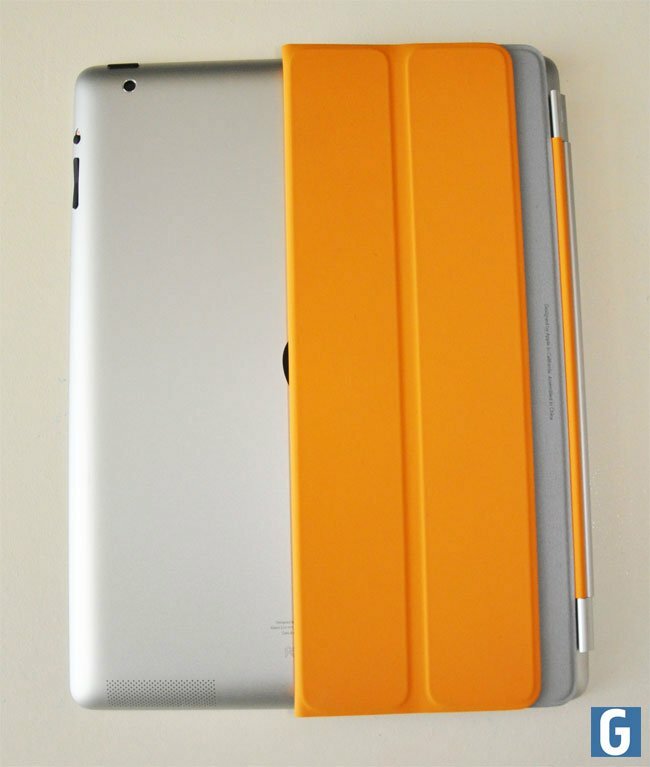 A new feature on the second generations iPad 2 is the addition of two cameras, one facing front and one rear, which provide similar results to the camera built into the fourth generation iPod touch. 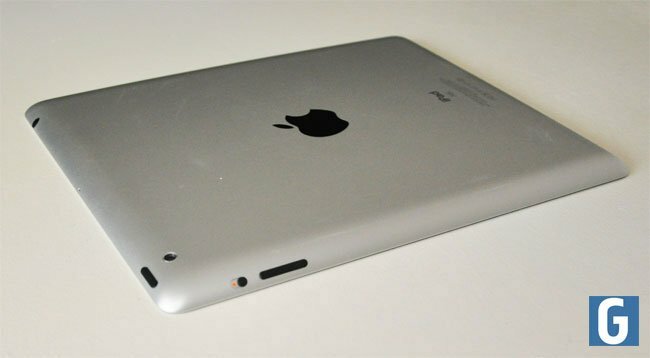 The HD camera on the rear of the iPad2 is capable of recording 720p HD video but doesn’t do a fantastic job of capturing still photos, especially when compared to the iPhone 4’s cameras. 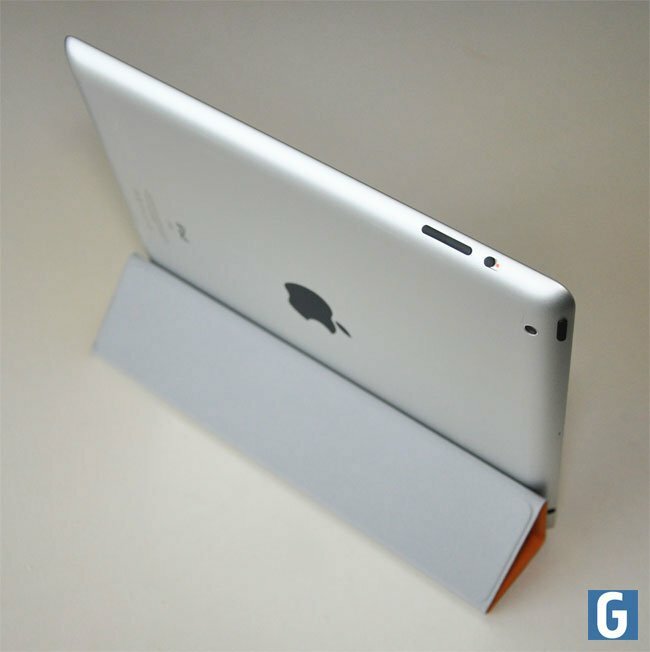 The front facing camera is a VGA (640 by 480 pixels) designed mainly for use with Apple’s FaceTime calls only, but both cameras can be used with the included FaceTime app, Photo Booth, and the new iMovie for iPad if required. 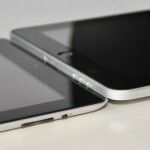 A great new feature exclusive to the iPad2 is its new HDMI out feature, which allows you to display your iPad 2 screen onto a HDTV or monitor via a HDMI port, although you will need Apple’s new HDMI dongle ($39) to complete the process but this will provide high-definition video output at resolutions up to 1080p, as well as Dolby Digital surround sound. It’s a great feature if you like to play HD media or games on larger screens or need to show presentations or use your iPad 2’s screen for tutorials. 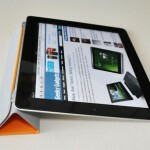 To display the iPad 2 screen a new mirroring mode is used on larger displays and the connection process works using the dongle seamlessl, removing any worries about setup problems before a presentation. 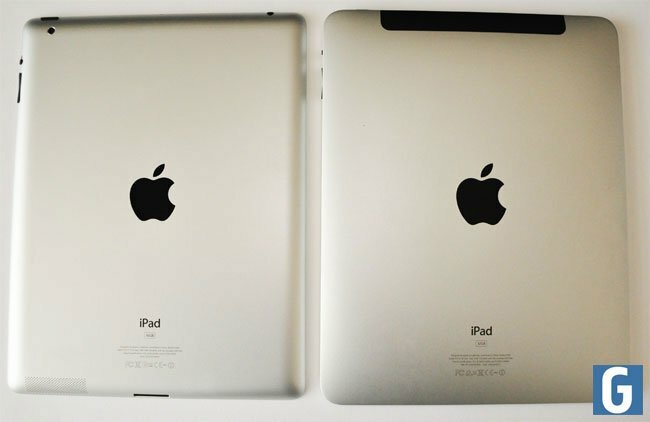 But be aware that due to the 4:3 aspect ratio of the iPad 2, you will experience a couple of black bars on the TV while in mirroring mode. 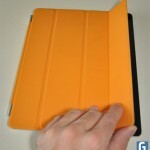 One of the most talked about accessories for the new iPad 2 has been Apple’s new Smart Cover case, which uses magnets to neatly attach itself to the left hand side of the iPad 2. Magnets are also used in conjunction with the iPad 2 operating system to automatically turn off the device when the cover is closed, powering backup the iPad 2 in the blink of an eye when the cover is then re-opened. 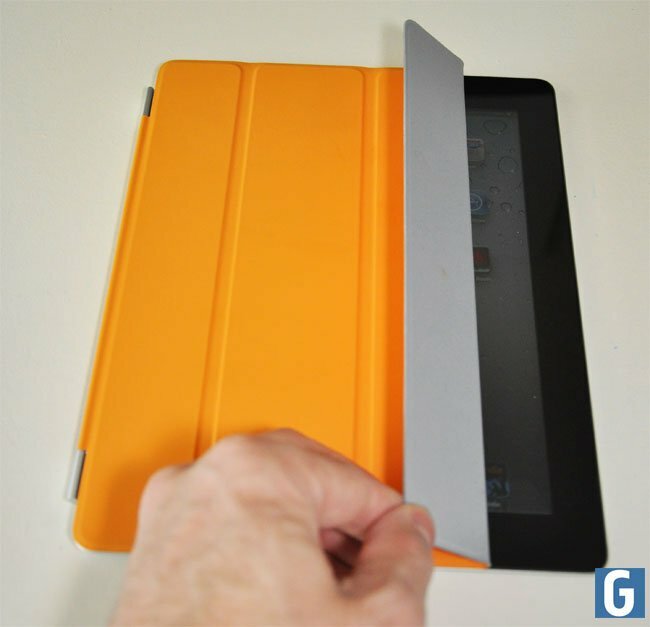 When I first heard magnets were being put into the device I did have a few concerns but Apple has integrated them without any problems and enhanced the device with a custom built cover.The Smart Cover can folded to create different supports for the iPad 2. 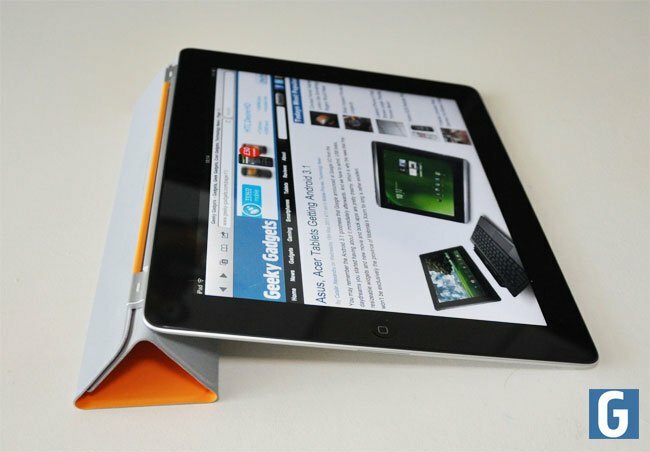 Folding to create a triangle which can then either sit underneath providing a shallow angle for more ergonomic typing, or used to stand the ipad 2 upright for media viewing. 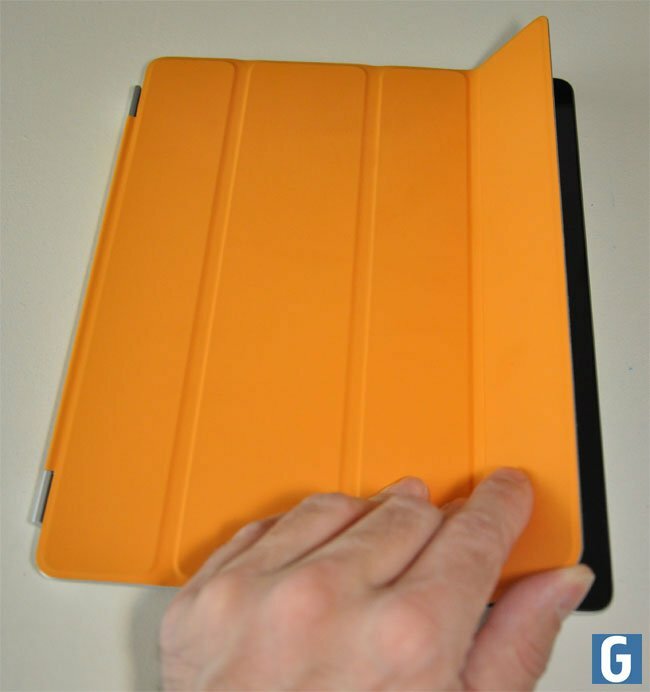 The Smart Cover can also be folded in half and held flat the on the back of the iPad 2 again by the magnets keeping the cover stored fast against the device while providing access to the rear camera. 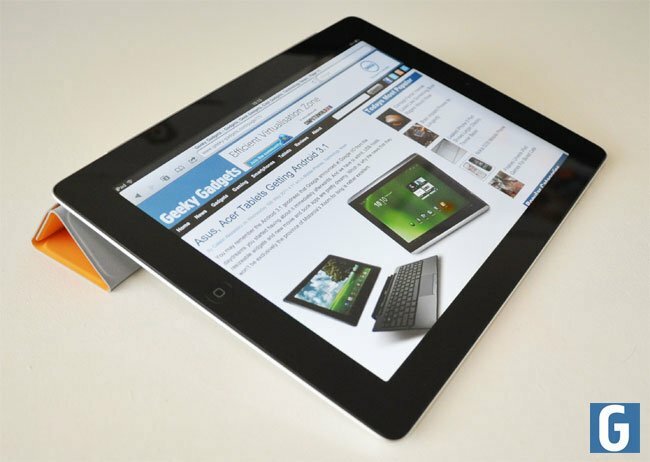 After using the new iPad2 for a number of weeks now, the added speed and sleeker design of the new iPad 2 are great additions especially the HDMI out and mirroring features. 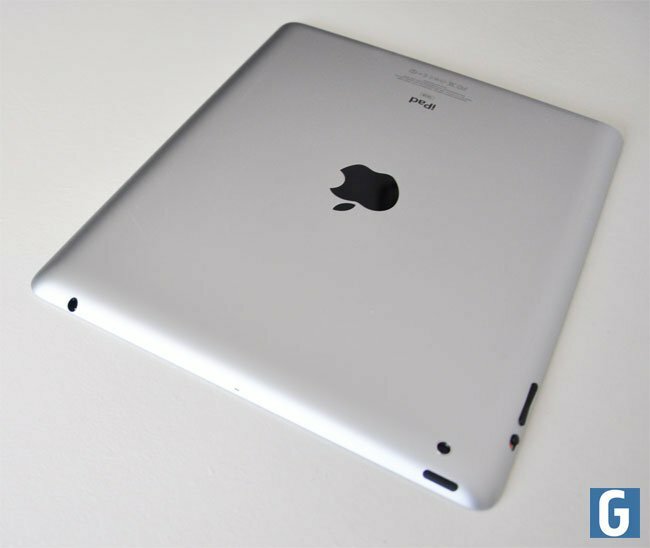 The new iPad 2 still puts Apple well in front of the competition currently on the market, in terms of design and specifications. 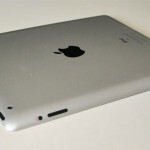 However if you already own an a first generation iPad and don’t feel the need for extra speed and enhanced graphics the upgrade might not be worth the expense, at the current time, but if you are a teacher or presenter who requires the mirroring or HDMI out features, exclusive to the iPad 2 the upgrade is definitely worth considering. 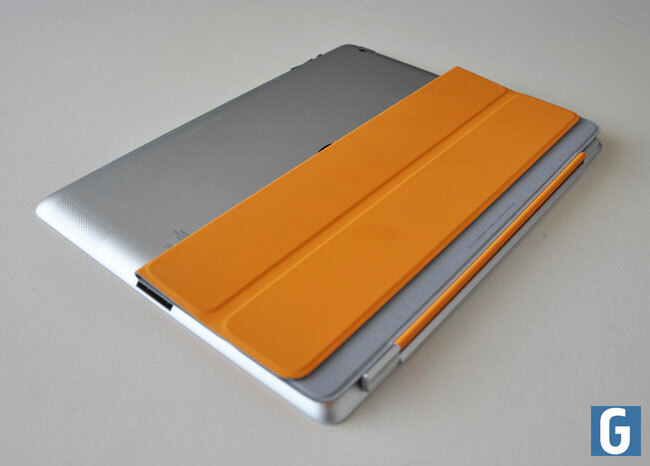 If you are a first time iPad buyer or making the jump to second generation all you have to do now is decide which model to choose from the eighteen now available. 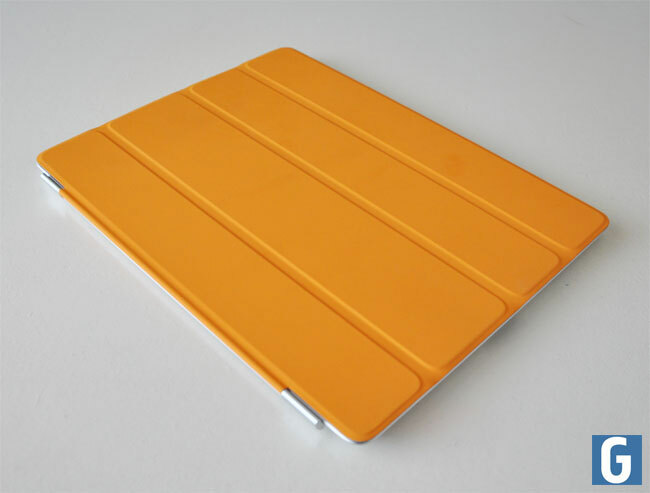 The iPad 2 comes in a Wi-Fi-only version as well as two separate Wi-Fi/3G versions: one compatible with AT&T’s GSM-based cellular network, and a different one compatible with Verizon’s CDMA-based network. 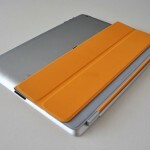 Again it comes in 16, 32 and 64GB versions and is now available with either a black or white bezel. 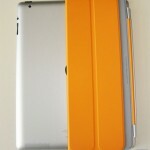 Overall the iPad 2 is a great tablet, Apple have basically added enough new features and changed the design to make the upgrade to a new iPad 2 appealing to many, there are a couple of things that we would have liked to see in the new iPad 2, the main one would be a higher resolution display, but we suspect that will arrive in the iPad 3. 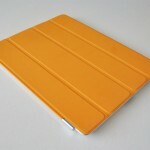 Have a look at our iPad 2 gallery below for lots more photos.